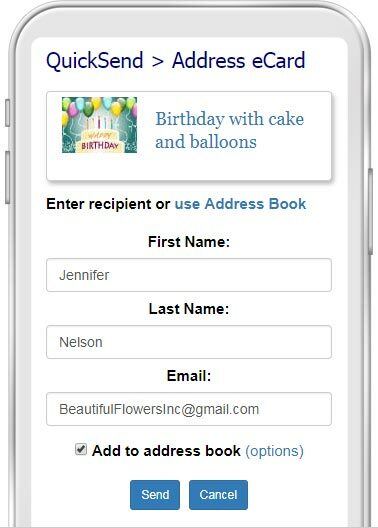 Use our QuickSend feature when you want to quickly send an eCard, invitation or survey in less than 30 seconds. Perfect for Tradeshows, Sales Meetings, Customer Service follow-ups and more! You do not need to download an app to your device to use this feature. QuickSend works with cell phones, mobile devices and desktop computers. Create and save QuickSend eCard templates for different occasions. When you're ready to send, sign into CorpNote and go to eCards > QuickSend in the navigation or click the icon on your phone's home screen (see instructions in the next section). Select your eCard template, enter a name and email address for your contact and click "send." Go to your 'Sent eCards' history to see who views your eCards. Sign into your account and go to eCards > QuickSend in the navigation. When you find an opportunity to keep in touch with someone, go to your web browser bookmark for QuickSend or if you are using the Apple device 'Add to Home Screen' feature click on the icon.